Widely regarded as the ultimate superfood, quinoa has come leaps and bounds in the consumer world. Why so super? Well it’s nutrient range is considerable – iron, B-vitamins, magnesium, potassium, calcium, Vitamin E and full of fibre and protein, not to mention it is naturally gluten-free so anyone with an intolerance or irritation when it comes to gluten can enjoy a great range of foods, complete with all the nutrients you need for a healthy diet. Whilst it’s easy to find the raw quinoa grain in supermarkets, not everybody has time to cook it up and be inventive in the kitchen with it. So finding products with quinoa as the main ingredient has become something of an obsession of mine of late – take a look at my top 5 favourite quinoa products on the market at the moment and give them a try for a healthy, varied and complex, nutrient-rich diet! 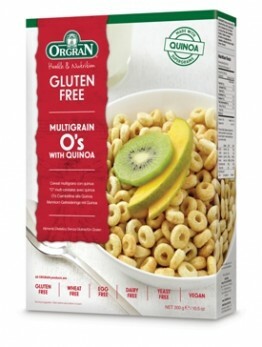 Easily my favourite cereal of the moment, Orgran’s Wholegrain O’s are just like Cheerios without all of the nasty wheat and sugar. Made with brown rice, yellow pea and of course lots of quinoa, this is a lovely way to start the day for anyone struggling to find a quick answer to your favourite sugary cereals. A lovely alternative to greasy potato chips, these quinoa chips are made with quinoa flour, lentil flour, pea flour, corn flour and rice flour and uses less oil than typical crisps. Natural colours and flavourings also make up this light savoury snack, meaning they actually taste abundant in flavours, rather than just starchy. Great for its organic credentials, this bread only uses 7 ingredients (especially astounding when you consider a normal wholemeal loaf can have up to 30 ingredients), naturally comprising of rye meal, natural sourdough and quinoa. This bread from Biona tastes homemade and, due to the fewer ingredients, is much more dense and filling than typical loaves. Food Doctor’s ‘meals in a pot’ are fairly new on the scene and they’re likely to be the new ‘in’ thing with those on the go who like to lead a healthy lifestyle. A savoury marvel, you’ll enjoy the great range of flavours from onion, to garlic, to tomato, all in a convenient pot packed full of your favourite quinoa. Uncle Ben’s has been around for what seems like forever, and they’ve finally jumped on the quinoa band-wagon with this wholegrain rice packet. This yummy parboiled wholegrain rice comes with steamed grains red quinoa, millet and pearl barley and only uses the tiniest bit of soy sauce and salt to flavour. All the rest of the flavour you’ll find in the gorgeous red pepper and cumin spice. Previous Entry Healthy Recipes: Homemade McDonald’s Egg McMuffin!